weaselsnake: Why does the blogosphere hate newspapers? There's no love lost between bloggers and newspapers. You can't swing a dead cat around the blogosphere without hearing about how newspapers are dying, or references to "dead tree media," and invariably, newspapers are lumped in with the so-called 'Mainstream Media,' or MSM (not, of course, the other, more hilarious uses of the acronym). It's hard to tell, exactly, what beef blogs might have with newspapers. The notoriously libertarian blogosphere is filled with appeals to government transparency, open-access, sunshine laws and freedom of speech, expression and the press. These are exactly the same causes that newspaper journalists have been arguing for since the dawn of the republic. From the Reporter's Committee for Freedom of the Press, to Reporters without Borders to Sunshine Week, to any of the dozens of Supreme Court cases protecting free speech and freedom of the press (from the Alien and Sedition Acts to the Pentagon Papers and forward), newspapers have been on the side of First Amendment protections, which you'd think would endear it to the universe of blogs. But newspapers have the bad luck to be mostly published on paper, not online. The moniker "dead tree media" has stuck, and the smug self-congratulatory nature of opinion blogs have meant that virtually any mention of newspapers should be accompanied by a sneer and a reminder that newspapers are dying anyway, and soon, citizen journalists will magically replace newspapers. The truth of the matter is, most of the criticism of the 'Mainstream Media' is fair and true. It just doesn't apply to newspapers. Broadcast media is emblematic of the worst excesses that bloggers bring to light, and are guilty of the most shallow, cheap, profit-driven coverage possible. All the while, newspapers are toiling away, producing hundreds of thousands of words of accountability coverage, investigative reporting, and in-depth journalism. When the blogosphere deigns to mention newspapers in their media critiques, they generally focus on the editorial page, completely ignoring the firewall between editorial and news coverage at newspapers, and focusing on a tiny portion of the newspaper's total coverage. Of course, just because bloggers aren't always right about newspapers' shortcomings, it doesn't they aren't dying. Slate's Daniel Gross summed up the situation well: newspapers may be dying, but it's greedy owners sucking value out of profitable companies that are doing the killing. Most people don't know that newspapers are by and large very profitable. The dire predictions from analysts and media critics focus on the assertion that newspapers aren't profitable enough. So perhaps bloggers and newspapers should bury the hatchet. After all, most bloggers are commenting on newspaper's original coverage, and if newspapers continue to be mismanaged, they may find themselves joining the ranks of new bloggers. Eldritch: The whole idea of newspapers giving away free content is a tough one. Truth be told, I don't think there was any way for the newspapers to win. When the newspapers were first moving online, all content was free. The expectation, and the demand, was that anything on the internet would be free of charge. In fact, there really wasn't even a mechanism for people to charge for content yet. So if newspapers tried charging for their stories, or just ignored the internet, I think they'd be in even worse shape than now. Of course, the prevalence of free content has given people the expectation that they shouldn't have to pay for journalism, and that's no doubt fueling people's abandonment of the core business (printed papers). But the real lynchpin of the problem is advertising. 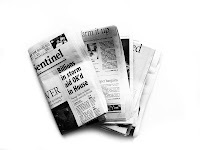 Newspapers have tons more readership than they've ever had from mere print publishing. It's the fact the online advertising doesn't pay nearly the same as local, print advertising. So you could say newspapers are thriving, but newspaper advertising is withering. Pseudonym: I agree 100%, but I'm still sickened by the awful weekly column in my local major paper about the authors two "hilariously" precocious kids. The byline gives the blog address her column is pulled from. It's not so bad that the content itself is bad (which it is), but the fact that papers are pulling content from online for filler. I read the newspaper for interesting news and events, things that are meaningful to me, and to other people. Not to read someone's personal anecdotes about their stupid kids that leaves me wondering "why are you telling me this?". Blogs seem to be much more to me about the "pull"; that is, the seeking out of information specific to what you're interested in, rather than newspapers, which, in my opinion, are about the "push" - editorial decisions about what affects the majority of the people. This is also what bothers me about local news, how most of it is local human-interest (re: worthless) stories and US news I read on the internet the day before. In the case of our Blogger Turned Serious Journalist, if I wanted to read her column, I'd read her blog.